Why do people choose to donate hair? Hair donations go towards making wigs for children and adults who have temporarily or permanently lost their hair. This can be from chemotherapy, radiation therapy, thyroid disease, alopecia areata (a disease that attacks hair follicles), Trichotillomania (a hair-pulling disorder), severe scalp infections or other medical issues. I first decided to donate my hair after hearing from a teenage girl who lost her hair from chemo. She spoke about how despite all the painful side effects of cancer, the hair loss was the one constant reminder that forced her out of feeling ‘normal’ – a visual representation of illness. Once I realised that something replaceable to me had the potential to be valuable to someone else, I decided to grow my hair out and donate it. Anyone and everyone who’s willing and able – girls, boys, adults, children! For most organisations, it doesn’t matter whether your hair is straight or curly, fine or thick – though many don’t accept hair that has been bleached, dyed, or hair that’s over 5-10% grey. It’s important to check the guidelines of each organisation carefully. How much hair has to be cut off? Whilst organisations have varying requirements, the minimum is generally 8 inches, although most prefer it to be at least 12 inches. On average, women’s hair grows about 5 to 6 inches a year (approximately a quarter of an inch per month), so it’s likely that you’ll be working towards a goal for a while. I found that as soon as I decided to donate, I started taking much better care of my hair. I avoided unnecessary products, let it dry naturally whenever possible, and minimised straightening it. Split ends are not your friend! There are countless non-profits and charities creating wigs to help specific causes around the world. Though Hong Kong doesn’t have dedicated organisations (and the CancerLink has stopped accepting hair donations), you can easily mail it overseas. Certain places don’t accept overseas hair donations, so consult websites beforehand. Charity’s objectives and hair requirements vary, so sticking to the requirements is the best way to make sure that your hair gets put to good use. 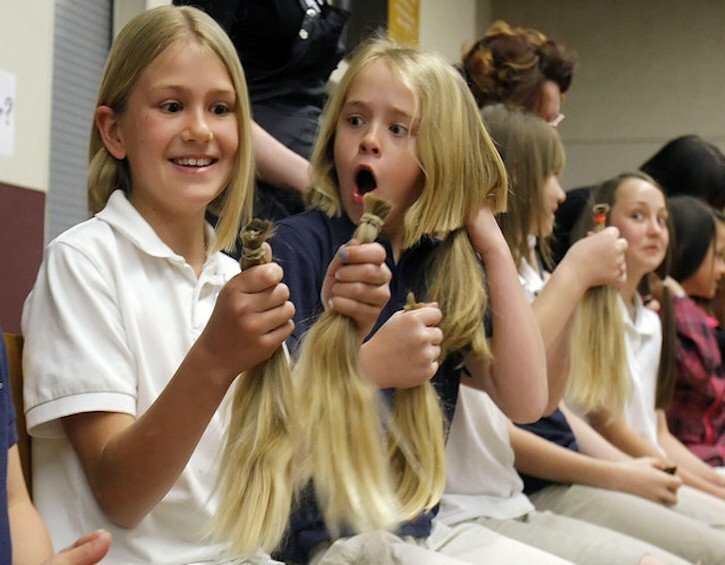 For example, an 8 inch donation is too short for Locks of Love but suitable for Pantene Beautiful Lengths. And if your hair is dyed, Locks of Love (USA) and Little Princess Trust (UK) are two main charities that accept treated hair. Many hair donations end up unsuitable, and since this is generally at the discretion of the wig makers, organisations can’t let you know whether your hair ultimately goes towards creating a wig. Unsuitable hair is often sold, with funds going towards the making of hairpieces. With the controversy around this in recent months, it’s worth investing where the funds go before making your final decision. With that in mind, if you feel it would be more beneficial for you to donate funds directly, this is generally welcome by organisations across the board. Pick your charity before the cut so that you can follow the specific requirements. If you’re cutting it at a salon, phone ahead to check that the stylist is happy to cater to your requests. Whether you’re at a salon or at home, your hair needs to be completely dry before you cut it. Damp hair means your hair will automatically be unsuitable, (it’ll mould before it can be made into a wig). Next, tie your hair into a ponytail or braid and snip above the tie. Some organisations prefer the hair in one ponytail or braid, but if you have layers, it’s worth separating it into several sections, so the length is split evenly. Either way, seal the snipped section(s) in a clear, resalable plastic bag. Pop the air-tight bag into a proper envelope, and mail it to your chosen organisation. Many people opt to raise funds to donate with the hair. The costs are generally invested directly into the cost of making wigs. Making wigs is costly as each one is precisely tailored to fit the shape of the patients’ head (which is especially important for younger children!). Most organisations find donated hair and finances to be equally important in providing hairpieces, especially since majority of the non-profits provide wigs are provided at no cost to the recipient or their family. This children’s cancer charity provides wigs to children in the UK and Ireland who suffer from hair loss due to cancer treatments and other illnesses. Requirements: At least 7 inches of hair. Dyed hair is accepted, as long as it is not in an unnatural colour. Pantene makes wigs for women who have lost their hair due to cancer in America. This public non-profit organisation provides hairpieces to financially disadvantaged children under the age of 21 suffering from long-term medical hair loss from any diagnosis. Requirements: At least 10 inches of hair that is not bleached. Dyed and permed hair is accepted. Wigs for Kids is a non-profit providing free hairpieces to children and teens under the age of 18 who have lost their hair due to medical reasons. Provides to children throughout America. Requirements: At least 12 inches of undyed, non-bleached, and non-highlighted hair. Not to be confused with the above organisation, this non-profit provides wigs for children with hair loss as a result from various illnesses, such as cancer, alopecia, trichotillomania, and burn victims. It focuses on providing for children throughout Michigan. Requirements: At least 7 inches for a wigs for boys or short wigs for girls. For general wigs, minimum 10 inches of non-chemically treated hair. If you’re a Hong Kong organisation who accepts hair donations, or have insight into helpful resources, please email [email protected] with relevant information. Featured image via Unsplash, Image 1 via Sassy Media Group, Image 2 via www.4.bp.blogspot.com, Image 3 via www.briebrieblooms.com, Image 4 via www.img.ksl.com.